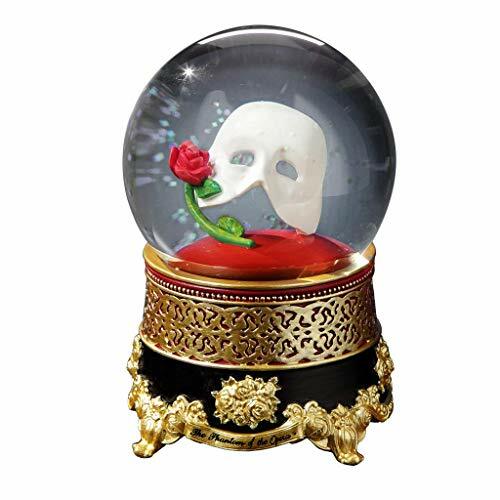 Phantom of the Opera Classic Mask with Rose Water Globe plays the tune: “Music of the Night”. 18-note musical movement, winds-up on bottom. Charming centerpiece does not rotate and features Phantom mask and red rose. Ornate gold and black resin base. Standard 100mm glass globe. Inside are multi-toned iridescent flakes that float about when the globe is shaken. Measures 6″ high x 3.75″ across at the base. CAUTION: For decorative purposes only. Not intended for children. The Phantom of the Opera(TM) Copyright 1986 The Really Useful Group Ltd.
18-note musical movement. Plays the tune: “Music of the Night”. Winds-up on bottom. Centerpiece does not rotate. Charming centerpiece featuring Phantom mask and red rose. Ornate gold and black resin base. Standard 100mm glass globe. Inside are multi-toned iridescent flakes that float about when the globe is shaken. Measures 6″ high x 3.75″ across at the base. CAUTION: For decorative purposes only. Not intended for children. The Phantom of the Opera(TM) Copyright 1986 The Really Useful Group Ltd.